This vivid Kompsat-2 space wallpaper shows the Amazon River in the heart of northern Brazil’s rainforest. The false color makes land vegetation appear pink, while water appears green and dark blue. This vivid Kompsat-2 space wallpaper shows the Amazon River in the heart of northern Brazil’s rainforest. The false color makes land vegetation appear pink, while water appears green and dark blue. In the upper-right corner, we can see some sparse clouds. The shades of pink vary — the bolder color representing thick vegetation with lighter pink showing where trees were possibly cut down. In fact, in the upper-left portion of the image, there’s a clear line between the two shades, showing where vegetation was cut. The white dots show man-made structures. 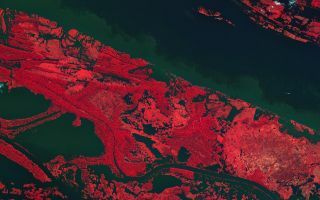 With their unique view from space, Earth observation satellites have been instrumental in highlighting the vulnerability of the rainforests by documenting the scale of deforestation. This image was released Oct. 18, 2013.